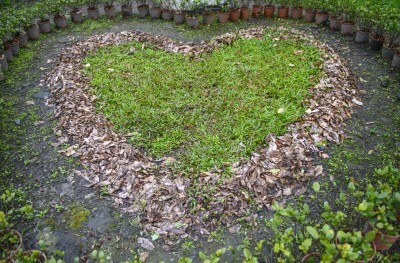 Blog | 4 Ways to Give Your Landscape Some Valentine’s Day Love - Legends Landscape Supply Inc.
It’s that time of year again for big romantic gestures, sweet nothings, cards and lots of candy to demonstrate how much you care. Why not indulge wholeheartedly in the tradition and give your backyard landscape the love it deserves? We show you how in four incredibly simple ways for Valentine’s Day and beyond. Read on for more. Your lawn will be in its worst condition during the winter months, so you’ll have to give it some tough love. As it lays dormant, buried under several feet of snow, expect it to turn a greenish-yellow colour and remain that way until the spring. When the blades of grass are encased in frost and snow it can become hard, brittle and susceptible to tearing, so you will have to refrain from walking on it. Walking on your lawn can cause extra damage, making it appear discoloured and unhealthy when it should be looking its best in warmer months. If there’s no snowfall, be sure to seed in places that are especially blemished toward the end of February, to give it the boost it needs for its springtime reveal. It’s always a good idea to know the three T’s of proper pruning: tools, timing, and technique. This can help you avoid cutting off potential blooms. February tends to be the best month to prune many of your fruit trees, as well as other trees and shrubs. Plants that typically flower during the summer, such as crape myrtle, hibiscus and abelia, form flower buds and can be pruned during the winter with no effect on their flowering. As a rule, plants that flower after June 1st are considered summer-flowering and can be pruned just prior to spring growth. There’s nothing lovelier on Valentine’s evening than creating a luminescent glow with landscape lighting. Hanging lights, string lights, decking lighting, and lanterns for your backyard landscape provide the perfect romantic backdrop. Use energy-efficient LED strip lights under steps and seats or create dramatic features by highlighting your favourite trees and shrubs. Legends Landscape Supply carries a wide range of lights that can help bring a picturesque touch to your next DIY landscaping project. For more bright ideas, talk to one of our landscape lighting specialists today! While February might seem like a bleak winter month, there’s nothing to stop you from putting some of your best-laid plans to paper (or computer). A professional landscape designer will always begin with a series of conceptual sketches, backed by a property survey and a topographical map. Once you’ve prepared your landscape wish list, our team of Burlington designers and contractors can help turn your vision into a reality. No project is too big or small. We’ve helped many of our customers in Burlington, Oakville, Milton, Hamilton and Stoney Creek bring a soft glow to their landscape. If you’re looking for a Burlington contractor to take your landscape to the next level, we’d love to hear from you. Our team of backyard experts can provide guidance for designing and installing fixtures that bring a gorgeous effect to your landscape, not just for Valentine’s Day, but all year long. Written on Wednesday, February 14, 2018.